Commercial fishing for salmon in BC began in the late 1850’s. Globally, Pacific salmon production reaches 926,000 mt per year on average. British Columbia produced an average of 25,000 mt of wild Pacific salmon per year between 1999 and 2012. The majority of wild BC salmon is exported to the US, Japan, and Europe. The export value of wild Chinook in 2014 was $21 million. Chinook salmon caught by drift gillnet in northern BC accounts for 5% of the total BC catch. Those caught in the central coast account for 6% and the transboundary catches are 5% of BC’s total catch. Transboundary River Chinook and Coho salmon stocks include the fish returning to the Taku, Stikine, and Alsek Rivers in Northern BC and Alaska. Abundance of Chinook stocks was determined to be a low conservation concern since they have met escapement goals over 75% of the time. 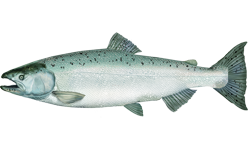 The North coast fishery is an Aggregated Abundance Based Management (AABM) fishery where Chinook from many different stocks are caught. The major natural stocks caught in this fishery include North/Central Coast BC, Oregon Coast north migrating and Columbia upriver bright Chinook. All of these stocks show varying trends in abundance, but overall more than 50% of monitored major stocks appear to be stable or increasing. Although there is some variability and uncertainty around the Chinook stocks on the central coast, the gillnet fisheries have a low conservation concern because relatively few Chinook are taken in this fishery as compared to the trolling lines fishery (88% vs 11%). Pacific salmon stocks are managed by the Department of Fisheries and Oceans (DFO), the US-Canadian Pacific Salmon Commission, and First Nations. The DFO has developed two annual Integrated Fishery Management Plans (IFMPs): one for the northern stocks and one for the southern stocks. Transboundary stocks are jointly managed between Canada and the US with monitoring and evaluation programs. Of some concern is the Taku River Chum salmon that are incidentally caught in these fisheries. Information on the status of Taku River chum stocks is lacking and these salmon runs have been depressed over the past two decades. The use of drift gillnets was deemed to be a very low concern as they are designed not to touch the bottom as gear may be lost or damaged when entangled on rocks. Chinook are not native to New Zealand, although they were introduced as a game fish in the mid 1800’s and became fully established in the early 1900’s. Chinook were first farmed in New Zealand in 1983. In 2013, 10,843 mt of farmed Chinook were produced in New Zealand. This represents about 88% of the global production of farmed Chinook salmon. The Chinook in New Zealand are farmed either marine net pens located in the inshore marine environment, or freshwater pens which are constructed in abandoned hydropower canals. Open net pens allow discharge to flow into the environment. However, monitoring reports studying potential effluent effects on both marine and freshwater systems found minimal impacts to the water and benthic environment. Changes to the seafloor under the pens do not occur outside the limits of the farm, and recover within 1-2 years. Resistances to parasites such as sea lice, and low farming densities have contributed to an absence of disease in the NZ Chinook. As such, antibiotics, pesticides and chemicals have not been used. Although Chinook are not native to New Zealand, they have become fully established and populations are also supplemented by hatcheries. Any escapes from marine net pens would not negatively impact the ecosystem as there are no wild and native populations of Chinook in New Zealand to affect. The marine salmon farms have the potential to affect predator species, some of which are threatened such as Hector’s dolphins, bottlenose dolphins, and southern right whales. Source of stock is domesticated broodstock; therefore wild populations of Chinook salmon are not depleted to source the aquaculture operations. Farmed Chinook requires about 2lbs of feed for every 1lb produced. This represents an overall protein loss and is of some concern. Much data is available on salmon farming in New Zealand. The industry is well-managed. Practices such as water and benthic environment monitoring, and effective biosecurity measures are in place, as well as measure to mitigate the effect of farms on predators. Salmon have relatively short life spans with high reproductive output. Chinook spend up to a year in freshwater before migrating out to sea where they spend anywhere from one to eight years before returning to their natal streams to spawn. Chinook typically spawn in large river systems such as the Fraser and Yukon rivers. The stock status of Alaskan Chinook is considered healthy, despite a decline in landings in recent years. Salmon fisheries are managed by the Alaska Department of Fish and Game (ADFG). The ADFG divides the fishery into distinct regions, which are managed separately. In both regions managers set catch limits, gear restrictions and area closures. Harvests using hook and line gear are highly specific; the capture of non-target species is of minimal concern. Hatchery augmentation of Chinook has led to competition within streams for food and space which may have reduced the success of wild Chinook populations in some streams where space and resources are limited. Troll (hook and line) gear has minimal impact on marine habitats. The removal of Chinook from marine and freshwater systems on the other hand may have a significant impact on the plants and animals that are connected to these systems. Ecosystem impacts include reduced food supply for marine and terrestrial mammals and birds such as whales, bears and eagles; lowered nutrient levels in forests adjacent to salmon spawning sites; overall lowered productivity in salmon-related ecosystems. Commercial fishing for salmon in BC began in the late 1850’s. Globally, Pacific salmon production reaches 926,000 mt per year on average. British Columbia produced an average of 25,000 mt of wild Pacific salmon per year between 1999 and 2012. The majority of wild BC salmon is exported to the US, Japan, and Europe. The export value of wild Chinook in 2014 was $21 million. Chinook salmon caught in southern BC by purse seines comprises 1% of the total catch in BC and those caught by drift gillnets also comprise 1% of the total catch. Purse seine and gillnet fisheries on the south coast of BC catch Chinook as incidental catch when fishing for more abundant species of salmon. The amount of Chinook and Coho caught on the south coast is relatively insignificant in comparison to the North coast Coho fishery and the West Coast Vancouver Island Chinook fishery. Most Chinook populations in southern BC have decreased substantially between 1997 and 2003. Most of the 35 populations declined 50% or more, but a few populations increased in abundance. The abundance of Chinook salmon in Southern BC is judged to have a very high conservation concern because many populations have declined substantially and some are listed as stocks of conservation concern. 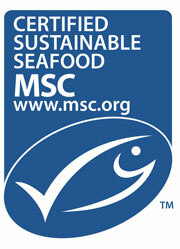 In addition, the substantial hatchery contribution to many populations complicates evaluation of wild stock status. Pacific salmon stocks are managed by the Department of Fisheries and Oceans (DFO), the US-Canadian Pacific Salmon Commission, and First Nations. The DFO has developed two annual Integrated Fishery Management Plans (IFMPs): one for the northern stocks and one for the southern stocks. Transboundary stocks are jointly managed between Canada and the US with monitoring and evaluation programs. Of great concern is bycatch of endangered Chinook stocks from the US in the southern BC Chinook fishery. However, purse seines and drift gillnets do not make contact with the ocean floor and do not cause habitat damage.